A beautiful morning at Loch Kernsary. I was fortunate to arrive just as the sun started to break through the cloud cover to my right. My chosen viewpoint was still in shade so I waited and watched as the sunlit area of the hill slowly expanded to eventually reach and illuminate the foreground in the above view. 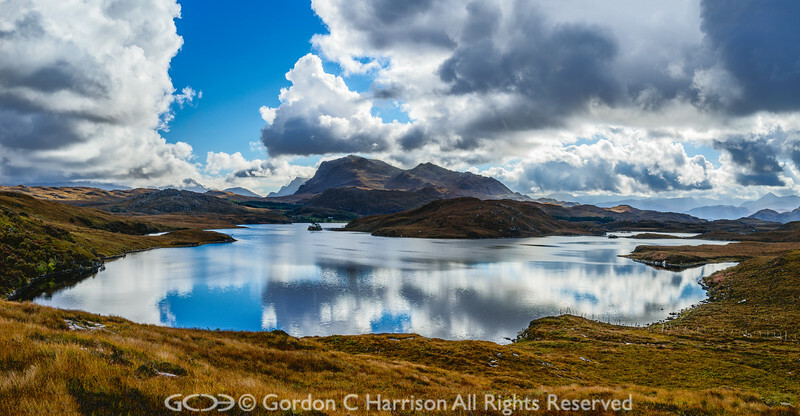 Dominating the far end of the loch is one of Wester Ross's finest mountains, the magnificent Beinn Airigh Charr, to its right in the far distance are the Torridon mountains and to its left the mountains of Wester Ross's Great Wilderness.